Chris Bailey, a graduate of Carleton University in Ottawa, wrote over 216,000 words on the subject of productivity on his blog, ayearofproductivity.com, during a year long productivity project where he conducted intensive research, as well as dozens of productivity experiments on himself to discover how to become as productive as possible. To date, he has written hundreds of articles on the subject, and has garnered coverage in media as diverse as The New York Times, The Huffington Post, New York magazine, TED, Fast Company, and Lifehacker. "Chris Bailey has tackled the daunting task of personally experimenting with any and every technique you can imagine that could positively affect your productivity. His dedication to the project and his intelligent conclusions, combined with his candor and articulateness, make this a fun, interesting, and useful read!" "Chris Bailey might be the most productive man you’d ever hope to meet." "Here's a book that promises, in the title, to pay for itself. And, the truth is, it will, in just a few days. And you'll even enjoy the journey." "Chris has written the ultimate guidebook for setting your life on fire. Read it, and you’ll not only get more done, you’ll feel better about it too." "So often we get stuck just doing what we have always done, even if it's not really working. 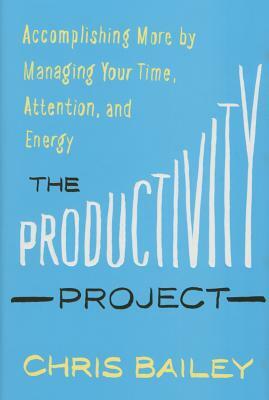 This book helps you cut through all the productivity advice out there to find and test what really works for you." "The Productivity Project is well-written, fun, practical and useful all at the same time. I loved this book. It's practical Buddhism at its best!" "Chris doesn't just want you to be more productive. He wants you to live a better life. This book is a two-hour ticket to not only becoming more productive, but becoming genuinely happier."